This Greek Rivival style home was built in 1859 for Dr. E.H. Murrell. At that time, the house was noteworthy for having a kitchen in the basement rather than in an outbuilding and for having an indoor bathtub, one of the first in Lynchburg. 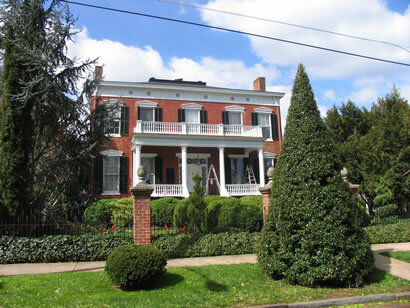 After World War II, it was called Yewcrest, for the fine yellow yew in the front yard and for its site on the crest of one of Lynchburg's seven hills. Note the 'Temple of the Winds' porch columns and the cast iron frieze with matching grillwork in the cornices. The house was the recipient of a Lynchburg Historical Foundation Merit Award in 1986 for exterior renovation.